The idiom to throw someone/something for a loop means to cause great surprise, confusion, or astonishment. The related idiom to knock someone/something for a loop has the same meaning. The main idea is that things are going well, circumstances are good, and suddenly something unexpected happens that causes trouble, confusion, surprise, or amazement. Take the quiz below to check your understanding, or read on for more details! Example sentences using to throw someone for a loop. 1. Polar bears are getting thrown for a loop by climate change. 2. Polar bears are being thrown for a loop by climate change. 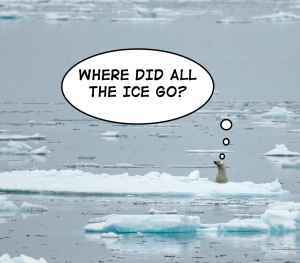 The disappearing polar ice caps are throwing polar bears for a loop. 1. Wall Street and the global markets got thrown for a loop by the Brexit vote. 2. Wall Street and the global markets were thrown for a loop by the Brexit vote. Subject verb agreement is important in these constructions. Remember that it is the first verb (the finite verb) that needs to be changed to match the agree with the subject. Try the quiz below to practice using to throw/knock someone for a loop! Can you use the idiom to throw someone/something for a loop correctly? Take the quiz and find out! Congratulations - you have completed Idiom Quiz: To throw someone/something for a loop. Some people are so used to hearing "no" that hearing "yes" _________ . them throws for a loop. threw them for a loop. throws them for a loop. is throwing them for a loop. You need the simple present tense because this is a general statement of fact. The correct object is "them." Global markets ____ for a loop by the Brexit vote. the verb "be" here needs to agree with the subject (Global markets) in number and tense. The correct answer is "were thrown"
I thought I was good at English grammar, but yesterday's lesson on phrasal verbs really _______ . is throwing me for a loop. was throwing me for a loop. got thrown for a loop. Active voice is correct, simple past is correct. Most of the equations were easy to solve, but one of them really ______ me for a loop. I'm sure I got it wrong. Of the options here, only the simple past tense makes sense. All this trouble _____ just thrown me for a loop. The present perfect is needed here, and the subject is singular, so the correct answer is "has thrown". threw her for a loop. were throwing me for a loop. Me is the correct object, and the simple past is the correct tense. It looks like this quiz was too challenging for you. Read the article carefully and try again. This was a good try, but there is still a lot to learn. Review the article and try again. A solid effort! Try reading the article again to understand the finer points.